Originally posted at Aalto University news. 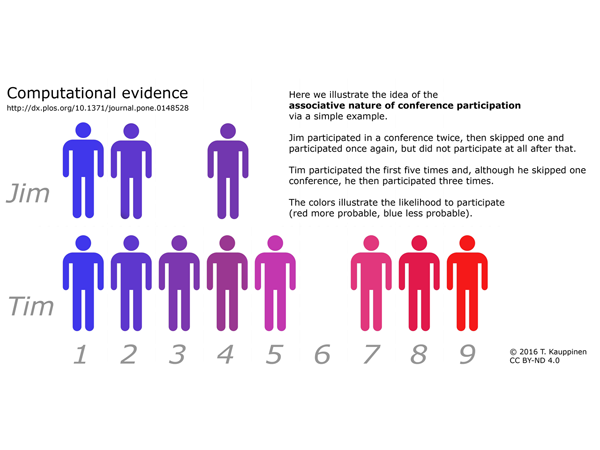 Modelling revealed that the probability of participating in the same conference again increases in relation to previous regular participation. Researchers at Aalto University, Institute of Physics Belgrade and the Saha Institute in Kolkata have used a computational model to prove that participants make a more favourable decision to participating in scientific conferences the more often they have previously participated in the conference. The likelihood to participate grows regardless of the qualities of the conference, like its location, size or specialization. “This first result opens up a novel, very rich research field. It will be interesting to study whether the same behavior can be discovered in other types of participations as well. Further on, the research agenda can include studying what kinds of actions increase community feelings and thus get people to participate. Our model can be used to research and understand participation phenomena, and perhaps can be used as a basis for new community building methods”, says docent Tomi Kauppinen from the Aalto University. The researchers collaborated to analyse data from six scientific conferences of different sizes and programmes, held in different locations. The data comprised approximately 100 000 individual participation details covering a period of up to 30 years. The calculations are based on the so called Pólya Urn model, which is a probability theory based model used to make quantitative analysis of large sets of data. The result of the study was recently published in the scientific PLOS ONE journal. The result is in line with the so-called power law, which is a common physical law that is realised in many natural phenomena like the sizes of earthquakes or moon craters. Further on, also man-made phenomena like word frequencies in most languages follow the power law. Digital information provides physicists and data scientists interested in societal phenomena and other researchers with immense possibilities to model social phenomena. The researchers already have thoughts about future research topics. “It will be interesting to study whether our model can explain participation patterns of events organized both in physical places and online. Further on, by studying scientific assets that are interconnected according to the Linked Science approach, it could perhaps be possible to find interesting laws about how science works beyond these participation laws”, says Tomi Kauppinen. Two of the co-authors Marija Mitrović Dankulov and Arnab Chatterjee, Saha Institute, are alumni of Aalto University. Tomi Kauppinen, Project Manager, Docent, Ph.D.